White Crane is one of the most prestigious styles in the traditional arts. Blending soft and hard power, it is fast and explosive, with a precise and deep penetrating power. Rooted in qigong, White Crane stylists boast health and martial prowess long into life. Explore this rare and desirable system with this popular collection from Dr. Yang, Jwing-Ming. Bundle contains 1 book and 3 DVDs. The secrets of internal power are revealed in this expert guide to Internal and External martial Qigong. This comprehensive martial arts training guide explores White Crane Kung Fu (Gongfu), one of the most famous martial styles developed in China. Martial Arts Qigong is integral to White Crane kung Fu and is a proven way to build explosive fighting power, known as Jin. It is commonly recognized that Shaolin White Crane is the root of Okinawan Karate, and has heavily influenced Japanese martial arts. From this book, a Karate practitioner will be able to trace this root back, and gain profound comprehension of empty-hand styles. Long time hidden secrets of White Crane revealed. A comprehensive analysis of Internal and External martial Qigong. 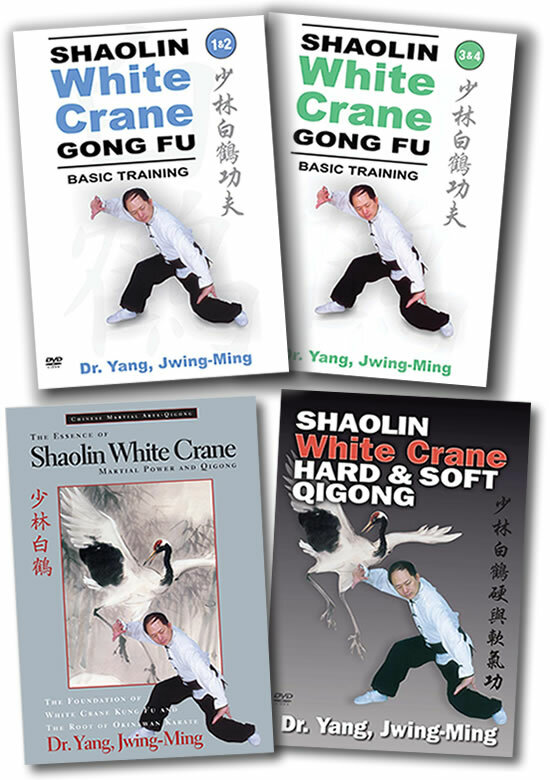 Complete sets of White Crane Hard and Soft Qigong training. A thorough examination of martial power (Jin). Presents more than 60 White Crane Jin patterns. Learn mental and physical training for explosive fighting power. Over four hundred action photographs and illustrations. Companion book The Essence of Shaolin White Crane. Develop extraordinary strength and explosive martial power. White Crane Hard Qigong (chi kung) strengthens the muscles, tendons, and ligaments, and develops the strength and flexibility of the torso and spine. Hard Qigong also helps to build a strong root, improves your stability, and increases your muscular endurance. In addition to strength and power, Hard Qigong training builds up Qi in the limbs, which then circulates to the internal organs, nourishing them with Qi and improving your vitality. Learn to understand the essence of internal power. To use White Crane martial power your body must move like a whip: smooth and flexible. Therefore the joints must be relaxed and the entire body connected, from the toes to the fingers. White Crane Soft Qigong trains you to be soft, relaxed, and coordinated. It also promotes smooth Qi flow and builds robust health and longevity. Soft Qigong promotes exceptional health of the spine and helps to keep the waist and torso fit and flexible. Shaolin White Crane Kung Fu, one of the most famous martial art styles developed in China. In Course 1, Dr. Yang presents a lecture explaining the theory and history of Shaolin White Crane Kung Fu (Gongfu), and instructs fundamental stances, movements and hand techniques. In Course 2, Dr. Yang explains and instructs fundamental Qigong exercises, Jin patterns, more basic movements and hand techniques. White Crane Qigong (Chi Kung) is a proven way to build explosive fighting power, known as Jin. In addition, Dr. Yang and senior students instruct and demonstrate the first barehand form, Qi Xing Quan and its martial applications. In Course 3, Dr. Yang instructs and demonstrates Up-Down Limbs and its applications, many solo and partner drills, Eight Petals Practice, Four Golden Points hand techniques, and Bridge Hands and its applications. Course 4 offers more fundamental techniques, qigong, jin patterns, the Shan He Quan (Fan Crane) sequence and its applications, Major basic hand techniques, Assistant hand techniques, 16 Basic kicking techniques, Fundamental Qigong and Jin patterns.